Okay, so here goes, take one! I’ve drafted my planned daily schedule for this school year. I wrote it in pen, but probably should’ve started in pencil, because I’m leaving plenty of room for changes and flexibility. 1) Give the core subjects priority. 2) Spend quality time with each of my littles – including the two not “in school” yet. 3) Allow for natural breaks in the day, as well as time spent in free play and outside. 4) Give time to reinforcing our learning by having fun with the subjects. No particular order to these goals. What do you think? Any I’ve missed? 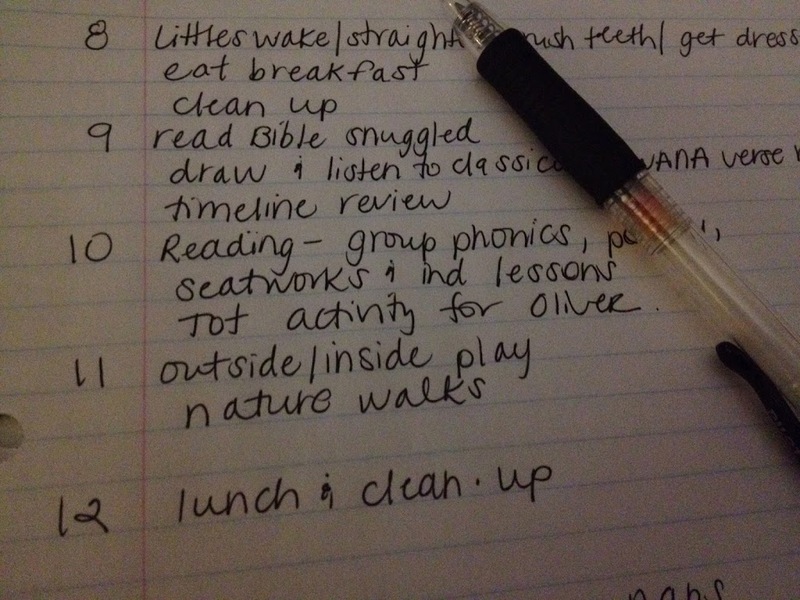 I know I like peeks into the days of other homeschool families, so, if you’re curious like me, here’s our daily schedule – take one! If we finish our work early in any time slot, it’s bonus time to spend freely! This is really helpful :). Thanks for sharing! And it might be obvious but what is notebookIng?? And do you have some quick recipes your family likes? I feel like it always takes me way longer than an hour to start dinner and have it on the table! No, not obvious! Over the summer I read A Well Trained Mind, which explained it really well. I’m keeping it simple for my guys, because they are young & beginning readers/writers. Basically, my 2 older guys will have one notebook each with dividers for each CC subject. When we review that subject during our week at home, they will then do a page in that subject’s section. For us, we’ll complete the pages in any of the following ways: 1) copy work – copying the grammar or other info from a book exactly on the page, 2) drawing a picture about what we learned – for example, a diagram of a plant, 3) dictation – re-telling me what they learned while I copy it into their book for them, 4) affixing a collected item onto the page – from a nature walk, printed off the internet, postcard from a trip or image cut from a magazine/etc. or 5) a completed activity page. Depending on the subject or page type, we’ll use different paper — art paper, lined pages, journal pages (blank up top with lines below), card stock, etc. We’ll also have a separate spiral bound art book for our Bible drawings. We emphasize one CC subject a day for expansion at home, so they’ll likely be completing one page a day. Perhaps two, but I’m being flexible with this since it’s our first time with note booking. As a child grows, there’s even more you can do with note booking! I’m hoping this will lay a foundation for good habits. This link is more involved than what we are doing, but is informative & leads to other helpful links. Does this help? Oh & for recipes…hmmm…well, I’ll probably start prep somewhere in the 4 o’clock hour for some meals. Also, I love to sneak in a crockpot meal made in the morning, whenever possible. But, for some quickies, homemade pizza (we buy the dough at TJoe’s), garden salad with grilled chicken, tacos or taco salad, fish filets like salmon or tilapia take very little prep & cook quickly, pasta pomodoro, loaded baked potatoes, and sautéed assortment of vegetables over rice or noodles. those are some quickies that are also favorites in our house. if the crew is getting restless to eat, i usually have them help in some way. is this helpful? This is great Beth! I’ve been working on our schedule too and it’s fun to see what others are doing! Love it! Thanks, Sarah! I’d love to see your schedule too! 🙂 I’m always so curious how others make it work!! When do you clean and do laundry if you stick to this schedule? Fold during math time and multi-task? Hey Erika! Good question! I will hop in the laundry room to switch loads between subjects or when they’re doing independent work. My husband and I fold in the evenings. We do very little school on Fridays, so I clean my whole house on Fridays. My guys help as requested. Daily cleaning is done throughout — the boys need to leave their rooms clean & beds made before they come down in the morning (w/ frequent reminders). We clean the kitchen up after each meal and we break for quick toy clean-ups as needed, but (pretty much) always before nap &/or bed. Hope this helps!